Good morning everyone, and thank you to ALL OF YOU who entered! This has been the biggest giveaway on Healing Cuisine yet! I loved reading your comments, tweets and fb messages! And so glad to hear that some of you will be trying Seventh Generation products for the first time. Congrats on making the switch over and hope you enjoy the product line! And now, for THE winner… Congratulations to Lorrie Schneck on winning her very own complete Healthy Home Starter Kit, complete with Disinfecting Multi-surface Spray , Disinfecting Bathroom Spray , Disinfecting Wipes , All-purpose Free & Clear Spray , Glass Free & Clear Spray , Shower Spray , Toilet Bowl Cleaner , Tub & Tile Spray , Natural Paper Towels , and a Seventh Generation recycled shopping tote. Lorrie, email me your contact info and mailing address. I’ll forward on to Seventh Generation and your prize will be mailed to you: elise@heailngcuisinebyelise.com. Congrats again, so excited for you! I had planned to get a new recipe posted as well this morning, but we had quite the busy time getting out the door and to the clinic today, so look forward to something tasty tomorrow or this weekend. :) Also have some big news to share SOON from our end! Very exciting newwwws that will be opening some new doors not only for Dave and me, but for Healing Cuisine, too! Hi Elise! 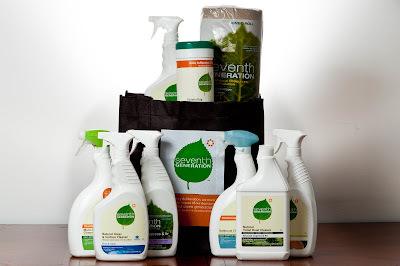 I was so excited to hear about Seventh Generation… but their products still include some harsh chemicals, including SLS (sodium lauryl sulfate) – can you recommend any product lines that don’t include SLS? So far I am a giant fan of Miessence, but it is out of Autralia, so shipping/duties are costly. Thanks! Hi ZanneV! So glad to hear you have been researching your cleaning products! And while Seventh Generation is biodegradable, you are correct, they are not the cleanest most optimal choice for use around our bodies. I LOVE the MiEssence all purpose cleaner. You can email MiEssence to locate a representative near you. I’m assuming you live in Canada? Ask your Maximized Living chiropractor. Many of them have their own seller accounts with MiEssence and may even be able to get you a discount on a bulk order. Mrs. Meyers cleaning products do not use SLS. They are a step up from Seventh Generation in cleanness, are 100% biodegradable and use essential oils to scent. However, not food-grade organic like MiEssence. I personally make most all of my own cleaning products. One of these days I’ll get some of my recipes posted. But, a great book where I learned all my tricks from, is Easy Green Living by Renee Loux. Recipes for EVERYTHING in there as well as cleaning tips without cleansers and GREEN products to purchase. It’s fabulous. I recommend it to everyone who is ready to switch to organic cleaning products. Making your own at home is cheaper than buying and it guarantees you have food-grade products. You can also mix them up in mass so it’ll last you many many months. Hope this has helped. If you have specific product questions feel free to email me: elise@healingcuisinebyelise.com. I can recommend whatever Dave and I use or try to provide more direction.